The Ministry of Trade, Industry and Energy said Sunday that the signing ceremony was held in San José, Costa Rica last Friday, with representatives from South Korea, Costa Rica, El Salvador, Nicaragua, Honduras and Panama attending. The English version of the tentative agreement will soon be posted on the ministry’s Web site. The Korean version will be made public shortly after formal signing. The two sides agreed to formally sign the trade pact as soon as possible, which will go into effect following parliamentary ratification. A ministry official said that it is the first free trade deal between an Asian country and the group of Central American countries. 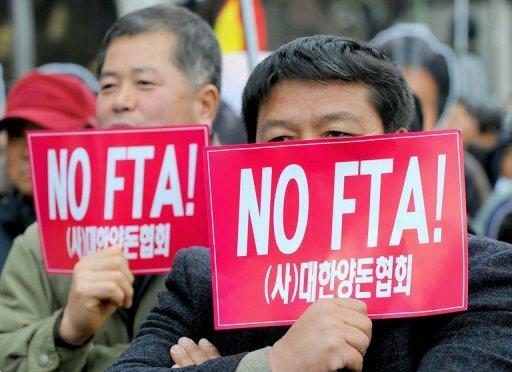 He expected that the trade pact will allow South Korea to make its way into the Central American market with great growth potential, and get a head start over rival countries like Japan and China.